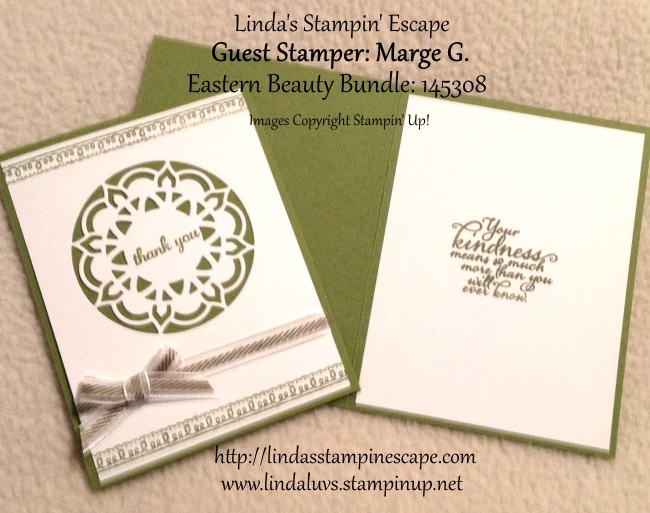 Today I have a treat for you, a guest stamper who shared one of her card creations with me … Marge G.
Marge used one of my favorite bundles in the Annual Catalog – the Eastern Beauty Bundle. I fell in love with this set when Stampin’ Up! offered this bundle as a “pre-order” for demonstrators and customers! I’ve actually hosted several classes using this bundle and featured it at my 2017 Spring Stampin’ Retreat … each card was different and we learned the many uses of the dies … Amazing!! Thank you for checking out my blog today, I hope your day is good one.